Microsoft is rumored to be planning to release Windows 8.1 Update 2 on September 9, according to various reports. The date coincides with the company's September Patch Tuesday, which will include a variety of fixes for bugs and vulnerabilities in its software, except, of course, the outdated Windows XP. Update 2 is expected to see the long-awaited return of the Windows Start Menu, but a screenshot shows that Microsoft is opting for a best of both worlds approach by combining Live Tiles into the menu. Initial reports suggested an August release, but it looks like September is now on the cards. 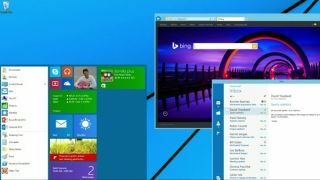 With Windows 8.1 launching last October, and Update 1 launching in early April of this year, a September release would make it roughly six months between updates. This is in line with the company's pledge for a faster pace of updates to its popular operating systems, both for the desktop and mobile releases. The news follows a leaked image of Microsoft's upcoming software plans, including Windows 9 and Office 2015. Windows 8.1 Update 2 was also listed. Microsoft has not yet confirmed any of the rumours.